Google Releasing Panda Update? Panda 2.2 or Panda 3.0? 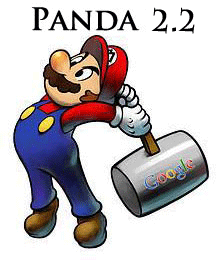 Home > Google News > Google Updates > Google Panda 2.2 Update Underway? As I noted in the June 2011 Google report, there is some early indication that Google is doing a new Panda release now. A WebmasterWorld thread has people taking notice of the ranking changes as of last night after 6pm EDT. I'm not sure if anyone is seeing it but everyone of my 15-20 websites has moved up or down today. Some of these sites were hit by Panda and some were not. I am definitely seeing a larger than normal reshuffle of the SERPs. Two of my sites that had been slapped are back in the SERPs today. They were fairly new sites, only a couple of months old, and they both dropped about 800 places to the bottom of their respective SERPs in mid April. Here they both are this morning with good positions for their targeted keywords. My old main pandalised site is still dead in the water though. Some history on Panda. Panda was released in February then Panda 2.0, the international rollout, hit in April and then Panda 2.1 was rolled out in May. So June is a nice time for Panda 2.2 or 3.0 - did you notice any changes? Will this result in sites finally recovering from Panda?